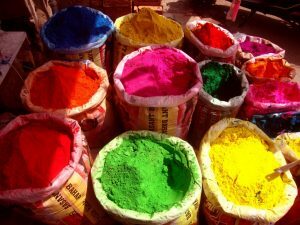 For the Hindu, colours play a very important role in the religion and culture and have a very deep significance, surpassing purely decorative values. Hindu artists use colour on the deities and their dresses signifying their qualities. Proper use of colours creates an environment, which should keep a person cheerful. Some of the main colours used in religious ceremonies are red, yellow (turmeric), and green from leaves, white from wheat flour. Red indicates both sensuality and purity. In Hindu religion, red is of utmost significance and the colour most frequently used for auspicious occasions like marriages, birth of a child, festivals, etc. A red mark is put on the forehead during ceremonies and important occasions. As a sign of marriage, women put red powder on the hair parting. They also wear a red sari during marriage. Red powder is usually thrown on statues of deities and phallic symbols during prayers. It is also the colour of Shakti (prowess). A red collared dress is put on deities who are charitable, brave, protective, and who have the capacity to destroy evil. On the death of a woman, her body is wrapped in a red cloth for the cremation. Saffron The most sacred colour for the Hindu is saffron. Represents fire and as impurities are burnt by fire, this colour symbolizes purity. It also represents religious abstinence. This colour connotation has a sacred meaning for the Hindu. It is the colour of holy men and ascetics who have renounced the world. Wearing the colour symbolizes the quest for light. It is the battle colour of the Rajputs, the warrior caste. Green is a festive colour. In Maharashtra, it represents life and happiness. For that reason, a widow does not wear green. Symbolizing peace and happiness, green stabilizes the mind. The colour is cool to the eyes and represents nature. Yellow is the colour of knowledge and learning. It symbolizes happiness, peace, meditation, competence and mental development. It is the colour of spring and activates the mind. Lord Vishnu’s dress is yellow symbolizing his representation of knowledge. Lord Krishna and Ganesha also wear yellow dresses. Yellow clothes are worn and yellow food is eaten at spring festivals. Single girls wear yellow to attract a mate and keep evil spirits away. White is a mixture of seven different colours hence it symbolizes a little bit of the quality of each. It represents purity, cleanliness, peace and knowledge. The Goddess of Knowledge, Saraswati is always shown as wearing a white dress, sitting on a white lotus. Other prominent deities would also have a touch of white on their dress. The Brahmin – the highest social caste – is associated with white. Hindu religious leaders cover themselves with white ashes to represent their spiritual rebirth. White is also the colour of mourning. A Hindu widow would wear a white dress in mourning. Blue The Creator has given the maximum of blue to nature (i.e.) the sky, the oceans, the rivers and the lakes. The deity who has the qualities of bravery, manliness, determination, the ability to deal with difficult situations, of stable mind and depth of character is represented by blue. Lord Rama and Krishna spent their life protecting humanity and destroying evil, hence they are colored blue.